In the southeast of Mexico is the state of Yucatán, a place that was once extremely important for the Mayan civilization. Because of this, there are many impressive ruins to marvel at throughout the region, from clifftop to jungle locations. This area of Mexico is also one of great natural beauty, home to incredible deep blue cenotes (or underground caves with unbelievably clear water sitting within them) and spectacular beaches, with species such as turtles and whale sharks swimming offshore. Dream about this paradisiacal region of Mexico for your next getaway; a place where families, couples or friends will all delight in the myriad sights, activities and possibilities. The site of the most-visited Mayan ruins of the region, Chichen Itza was one of the great cities of Central America for over 1000 years, and is undoubtedly worthy of its UNESCO World Heritage Site status. It stretches over an area of 5 square kilometres, and contains the ruins of pyramids, temples, observatories, sculptures, the court and hoops of an ancient ball game and a sacred cenote where rituals and offerings were practiced. 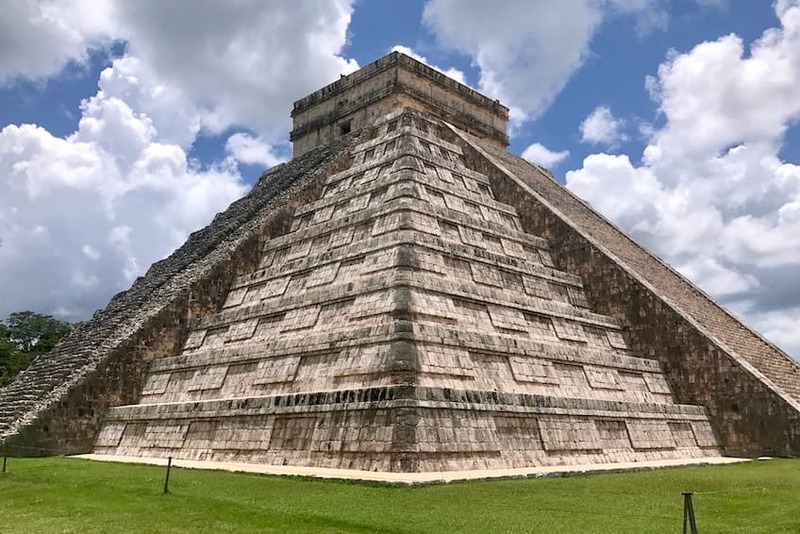 One of the most famous pyramids at Chichen Itza is that of Kukulkán, which is known for the incredible phenomenon that happens on its staircase during the equinox. At specific hours, the position of the sun causes the light to fall just right along the staircase, forming the wavy body patterns leading to the giant snake’s head at the base of the stairs. The entire pyramid is a wonder of mathematics and astronomy in its incredibly precise and symmetrical shape, and is a representation of the Mayan calendar. Ek Balam is another Mayan city ruin that should definitely be visited on your trip to Yucatán. Its name means “black jaguar”, and the 15 square kilometre site was an active city for upwards of 1000 years. There are over 40 structures here, and you can actually climb to the top of its 96 foot tall main pyramid, for a sweeping view over the green landscape. There is the added bonus of a beautiful cenote close to the ruins, that you can jump into for a refreshing swim! The ruins of Uxmal, close to the Yucatán capital of Merida, are another very interesting spectacle due to the meaning of its name, “thrice-built”, which refers to its main temple. In the construction of the complex’s great Pyramid of the Magician, it was actually built atop existing pyramids. Unlike many other Mayan pyramids, it is rounded in shape rather than being made up of square and rectangular forms. At one time this city was home to almost 25,000 inhabitants, and the intricate networks built to channel rainwater to sustain this population is still clearly visible, as well as beautiful examples of Puuc-style architecture. A city that now shines in yellow, the “Magic City” of Izamal is somewhere that should definitely be on your itinerary when in Yucatán. There are several ancient Mayan pyramid ruins throughout this city, supporting the belief that this was once the largest Mayan city in the north of this state. The pyramid of Kinich Kakmó is considered as one of the most important, in a city that had great economic and political power, and you can still see remnants of the stone roads that connected it with other significant settlements. However, Izamal is a delight for all, especially photography enthusiasts, where almost every building, wall and archway is painted a mustard yellow. The low height of the buildings adds a touch of the whimsical, giving Izamal the feeling of a toy town. For those willing to go a little out of the way towards the Guatemalan border, standing before the Mayan city of Calakmul is an extremely powerful experience. Nestled within thick jungle, it hosts the second highest pyramid in Mexico at a grand height of 55 metres. The whole area is a UNESCO Biosphere Reserve and World Heritage Site, and is the largest tropical reserve in Mexico! As you climb the great steps to the top of the pyramid, you gradually rise above the thick canopy for a spectacular view over the thick green. 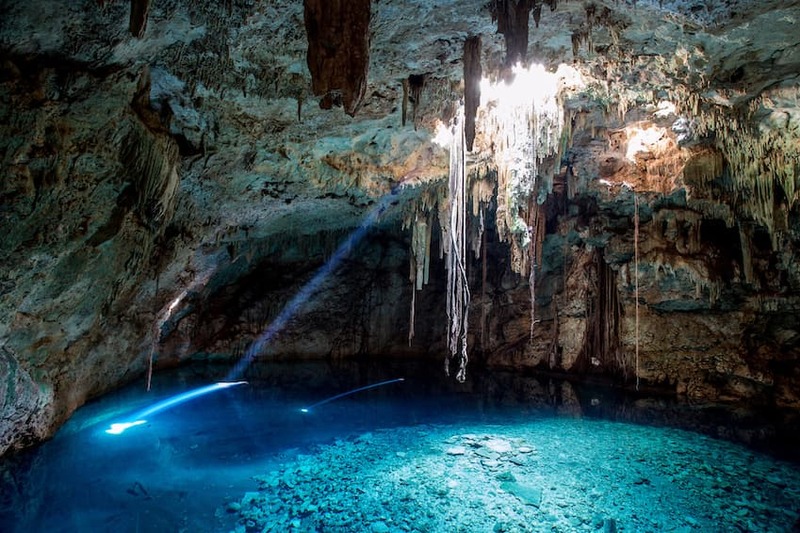 Returning to the magical natural occurrence of Yucatán’s cenotes, the underground sinkholes that litter the jungles of the region, filled with glassy sapphire waters. There are an incredible 6000 plus of these throughout Yucatán and Quintana Roo, however there are a few that are consistent favourites. In the area of Tulum, Gran Cenote is an incredible place for swimming and snorkelling amidst lush jungle, in some of the clearest water you will ever see. It’s a truly awe-inspiring experience to snorkel in an alien landscape of underground stalactites, through the cave that connects the two swimming areas. Tak Be Ha also provides breathtaking snorkelling opportunities in the blue jewel-like waters, with a cave ceiling of hundreds of stalactites overhead. For deep waters that lend themselves to a cooling swim, Yaxbacaltun is an ideal and very fun option. Grab a hold of the rope swing and launch yourself across the cavern into the blue! Arguably one of the most visually dramatic cenotes, however, is that of Suytun, close to Cancun. The round cave is huge, and has a walkway that ends in a circular platform right at its centre. Often there is a beam of light cutting through the air, a spotlight onto the azure water below. It’s a truly magnificent and mystical sight. Though if you are a thrill-seeker, a visit to Calavera is a must. Here, you can jump through tiny openings above ground into the deep water in the caverns below, or even scuba dive amongst the system of underwater stalactites. And these are just to name a few! From freshwater to the salt of the sea, Yucatán is blessed with many sensational beaches. Some of the best are in Tulum, with fine white sands and water of varying shades of turquoise. 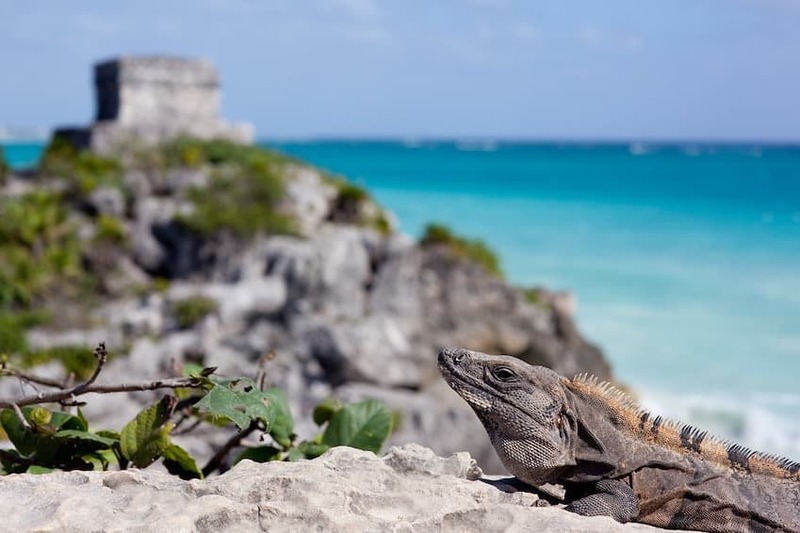 One of the added quirks to the beaches here is that you’ll often be sharing the sand with wandering iguanas! Beaches such as Playa Paraíso are popular spots for yoga, and it is unsurprising with such a tranquil environment, the sound of breaking waves as a backdrop. Tulum is also home to Mayan ruins with a scenic clifftop location, and these were once an ancient seaport. It is one of the few cities that was protected by a wall, which you can still see was an impressive seven metres thick, protecting the city from three sides. The oceans surrounding this corner of Mexico host an abundant marine life, from the sea turtles at Akumal Beach to the largest fish in the world, whale sharks, which congregate around Isla Holbox. Both of these placid animals you can get in the water with, and it’s a truly humbling experience to be swimming alongside either. To explore more of Yucatán’s incredible variety of wildlife, head to Sian Ka’an Biosphere Reserve, which stretches over 1.6 million acres, for tours of the tropical forests, wetlands and coastal and marine habitats. It’s an incredible day out for a family, where you can keep your eyes peeled for American Crocodiles, jaguar and puma, Black Howler Monkeys, White-nosed Coatimundi and four types of sea turtle amongst hundreds of other species. 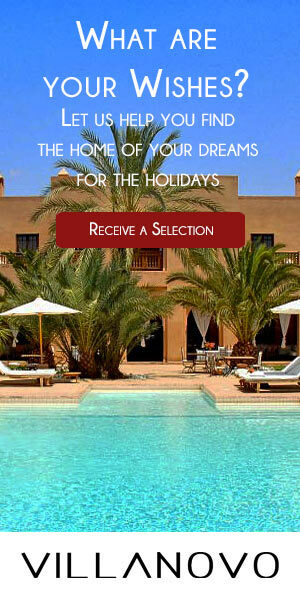 Alternatively, head for the Celestún Biosphere, where as many as 35,000 pink flamingos can congregate! Watch as the long-necked birds preen and walk delicately about the shallows in search for food, or take off in a flying burst of rosy hues. From bird’s feathers to another natural pink spectacle: the luminous pink salt lakes of Las Coloradas. The amazing shades are created by a large volume of microorganisms, particularly halobacteria, which have purple membranes. Bring your camera, though your friends will be in disbelief that it’s no trick of filters!